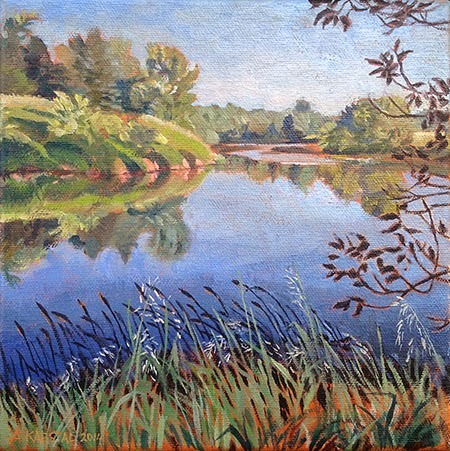 19 June 2014 finds me three kilometres northwest of Winchester Springs, Ontario, painting a view across the South Nation River from a steep grassy bank on its north shore. Tall grasses screen the river's edge. I have flattened some of the Bromus and Reed Canary Grass into a nest for sitting in the combined shades of a licheny sprawling Manitoba Maple and a stocky low-spreading Ash tree. canvas. Its foliage is thinning, losing some of the leaflets. At first Fred and I thought it was a willow as the regular Ash pattern of opposite leaflets is not evident in the branches that overarch the riverbank. Ashes are having all kinds of problems this year. Some north of here toward Ottawa are weakened by the Emerald Ash Borer, but some show symptoms of other diseases as well. Fred collects specimens of two differently diseased Ashes from the riverbank here, as well as from the Manitoba Maple, the enthusiastically healthy-looking invasive Cathartic Buckthorn, one of the Hawthorns that the Buckthorn is displacing, an American Elm, and a Soft Maple - wondering about Justin Peter's recent opinion that all our Eastern Ontario Soft Maples are, more or less, hybrids between Red & Silver parents. The landscape in mid-summer is lush and green. Trees and meadows along the river smile back at the sun. The sky is cloudless, and the unruffled surface of the deep, clay-cloudy South Nation reflects it with a subtly deeper blue, the colour of profound peacefulness, as if to tell me that all is well, and not to worry about details. Put tree diseases and climate change out of mind, along with concerns about Zebra Mussels wiping out native clams, and even what the weather's going to do tomorrow. Sometimes the broader picture, the general aspect of peace and well-being, is enough for the artist on a calm June day. I have chosen a milky terracotta colour for my underpainting to glow through the blues and greens with the friendly brightness of the day. A few Green Frogs have been calling sporadically along the bank, sounding like rather loose banjo strings. A Kingbird splashes down on the water surface several times to catch emerging insects like a clumsy Kingfisher who doesn't know how to dive. Suddenly what must be a Mink Frog calls "bok" several times from the river edge right below me - this sets us to wondering whether this species is known from here. Then a big piece of farm machinery rumbles past behind me, a reminder that the whole world isn't riverbank. Fred notes that it hauls a large, fluid-dispensing agricultural device, and that the soybean field it is driving along is "dead-flat and herbicided" right to the edge of the road. The reason we're here is to visit the vicinity of the Transcanada Gas pipline, proposed to be changed to carry Tar Sands 'dilbit' for the 'Energy East' route to New Brunswick. The existing gas pipeline goes under the river about 4.9 km upstream of here. Transcanada didn't publish the exact location of the crossing in their proposal for the transformation, and many GIS systems don't seem to contain it, but we found warning signs about the crossing on a road 4.2 km SW of here, which allowed us to infer the location where it crosses the South Nation River. The river along here, above Cass Bridge, is fast and deep, and the 140 records that are in our database within 6 km of the crossing contain several laments that, even in drought, the stream was too deep to sample for Unionid mussels. We have one half of an Elliptio complanata shell, collected by Matt Keevil on 7 August 2003, but that's all, and the water is quite high today. Today we've listed trees and invasive alien plants along the shores, Fred has scooped up the handsfulls of drifted cornstalkbits that seemed most likely to contain shells, and as I painted he was closely mobbed by Cliff Swallows nesting under the Cass Bridge just downstream of here. 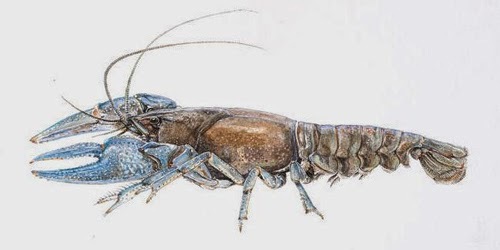 But most of our knowledge of the area within a 6 km radius comes from the North Branch of the river at Inkerman, where Fred has accumulated an impressive list of mussel species since 2001. The original oil painting, "Summer Calm South Nation" is available for bidding by e-mail to support our exploration of the proposed route of the Energy East Pipeline. Please contact Aleta at karstad(at)pinicola(dot)ca. The starting bid is $375 and the auction closes at midnight on Tuesday, 1 July. The Unionid list for the North Branch of the South Nation River around the bridge in Inkerman is: 3 records of Elliptio complanata, totalling more than 37 individuals, 4 records of Lampsilis radiata totalling 12 individuals, 2 records of Pyganodon grandis, totalling more than 37 individuals, and one Strophitus undulatus - all three of the common species, and one of the less frequent ones.